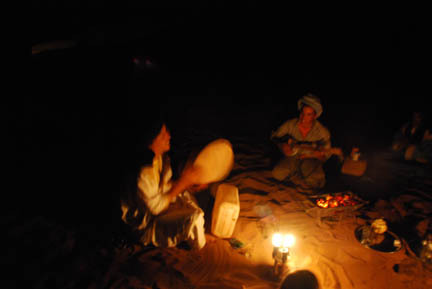 The Berbers are the ancient people who populated this area long ago to today. 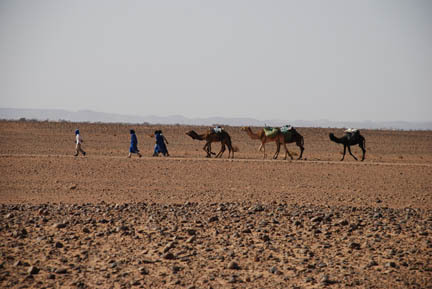 Most of them live in mud-brick villages and till the land, but some still live in the desert. They are a very friendly people who wave as you drive by and welcome you if you're walking around their village. 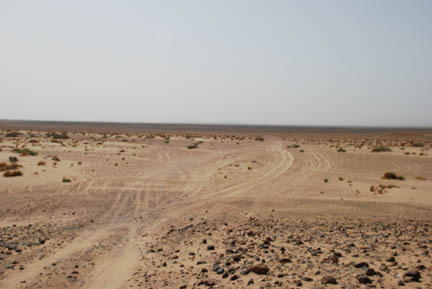 Through our campground host we hired one of the many Toyota Land Cruisers available for desert tours. 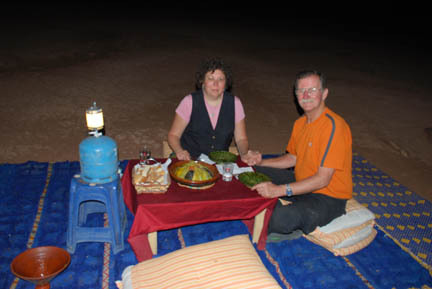 We opted for a private tour by 4X4 rather than a group tour or a camel tour. A camel tour would take a week to do what we did in two days and I can see us being bored out of our minds after the first day and wanting to get out of the sun and heat. The group tours are very popular and we saw several strings of Toyotas full of tourists each day. Not our style. We are taking a private tour. We have a Toyota and a guide, in white, and he has an assistant who does the driving. 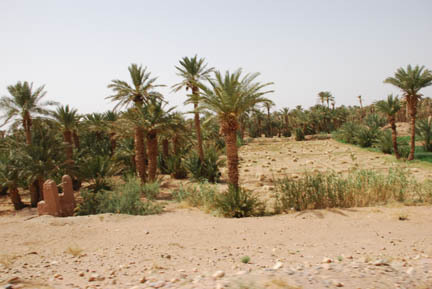 After traveling through the heart of the palmerie (date palm plantation) on little dirt tracks we came out into the desert. You'll notice the bundles of hand picked grain in the space between the palms. 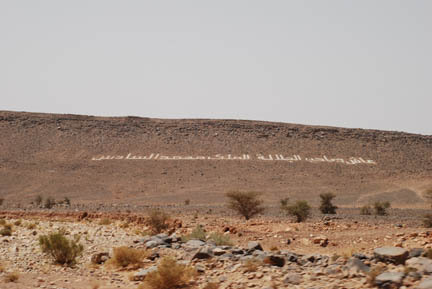 During our travel down the Draa Valley to Zagora we had seen several different sayings written in huge letters on hillsides. We didn't know if they were the name of the area we were in, an advertisement for Coca Cola, or a religious saying. We asked our guide about this one and he said it was a religious saying. This one is about a half mile away and several hundred yards long. Arabic reads from right to left, but then if you can read this you already know that. Our first stop was at a small mud village where there was a library with over 4,000 historical books dating as far back as 1063 AD. 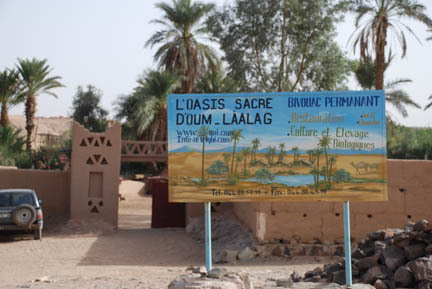 This town existed long before even a city like Marrakech. No pictures were allowed. The Arabic script is beautiful to look at and the gold illuminations sparkled. The calligraphy was impressive in its detail and perfection. From there we went to a small Berber tent encampment where we were served lunch of brochettes, wire skewers with bite-sized chunks of meat and some cooked vegetables. This is the restaurant, two dining rooms and the "kitchen" in between. There is another couple in the other room but we never met them. The piste (trail) we were following was not built with any construction equipment. It was created by thousands of vehicle trips going towards the same destination. Much of the desert sun-blasted rock had been kicked aside by vehicle tires. But at times a driver would see a route to the right or left that he felt was smoother, easier, faster and would split off the established path. Others might agree and another track was established that would rejoin later. Then it would happen again and again until there were, sometimes, dozens of tracks across the desert spread over a half mile wide all heading to the same place. Next we drove across more sun-blasted rock and dirt until we came to the dunes at Erg Chigaga, a popular destination for tourists to spend the night. That view is nearly 180 degrees centered on south. 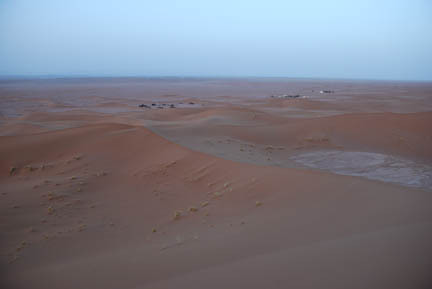 I'm standing on a high dune with the camp to my north. Our camp is the left hand one. 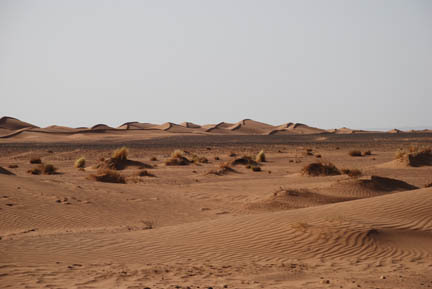 There were a total of nine camps that I could see from my dune. 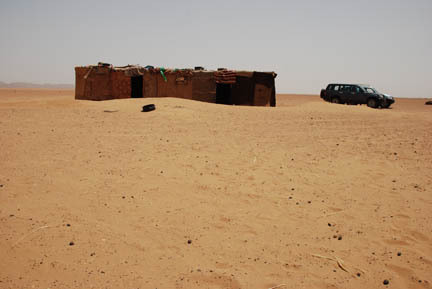 Each had Berber tents to sleep in, a kitchen/eating area and a mud hut toilet. Africa style toilet. This is a plastic or porcelain fixture that resembles a shower stall floor, except it has two raised foot print shaped places for your feet, one on each side of the center hole. You squat to use it, there is nothing to sit on. 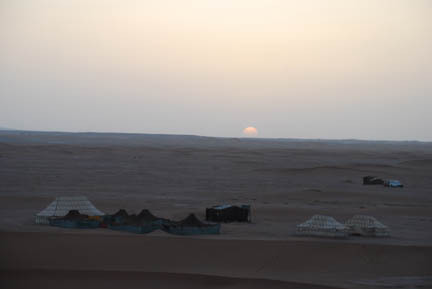 We watched the sunset from my dune, nothing spectacular because of the haze. The sun disappeared before it got to the horizon. After full dark we had a Tangine dinner. This is a standard Moroccan dish of meat and vegetables cooked slowly over a charcoal fire for a couple hours and served in the sizzling hot dish it is cooked in. After dinner was music by candle light and then star gazing. This establishment was so far down it would not even be considered as even a one-star hotel. But it had a 10,000 star rating overhead. We had no light pollution out here, we're even an hour and a half past cell phone range. And the low sun put black lips on the tops of the dunes. 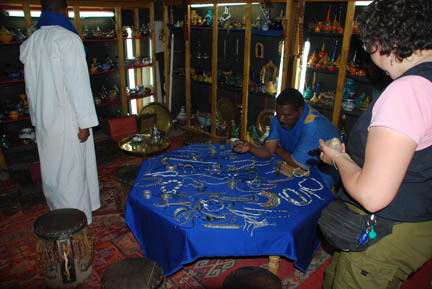 And then it was back to our campground, but with a stop at a rug, jewelry, souvenir, etc shop. The one bad thing about the shops is that if you express interest in an item, even by touching it, you are immediately asked to have tea and spend an hour bargaining over the price of the item. There is no way to browse items and ask prices to compare whether or not you might want to buy it. After tea (very sweet, very hot tea in very small glasses) is served they will open with a very high price, you counter with one about a quarter or third of his, he laughs and comes down a very little bit (maybe 5%) and wants to know what your next price is. This can go on for a long time. And all you wanted to know was whether the item is at a price that might interest you. We usually ended up paying about half of his opening bid. Probably too much, but he is a professional at this and we, like most every Western tourist, are amateurs. But we got so we didn't even want to look into a shop because of the high pressure sales tactics you are immediately hit with. It's too bad we felt this way, but to them this is a natural way of life. Having a marked price that included a profit margin for them is not the way they have done business for hundreds of years. From here its on the Horizon's Unlimited Mini-Meeting in Erfoud. But first a quick stop in two deep gorges.